Twenty-six Little Penguins were mauled to death over a number of days near their nesting areas, near Manly on Sydney’s northern beaches. “We are confident from the necropsy results, the style of killings, tracks and camera footage that a single fox is responsible for all of the deaths,” “Foxes are well known for indiscriminately killing or mauling multiple animals at one time including penguins and other ground birds, but they can also be notoriously elusive and difficult to locate. “This fox is particularly cunning and believed to be both bait and trap shy, which is why it has been able to avoid pest control measures that other foxes would not. Ms Tyas said. Australian Feral Management were asked to help on this site due to our experience in fox trapping and the NPWS not having the training and experience with leg hold traps in the Sydney Region. There was also limited time to trap the fox, as they needed a quick fix on a situation that was attracting large amounts of media attention. What most people don’t know that every golf course, large parks, water front areas, Creeks and bush land, cemeteries, many schools all contain foxes. Australian Feral Management discovered that the fox was killing over a very large area. However, after our site survey and looking at the location of each killing we decided to target a key area instead of the whole site. 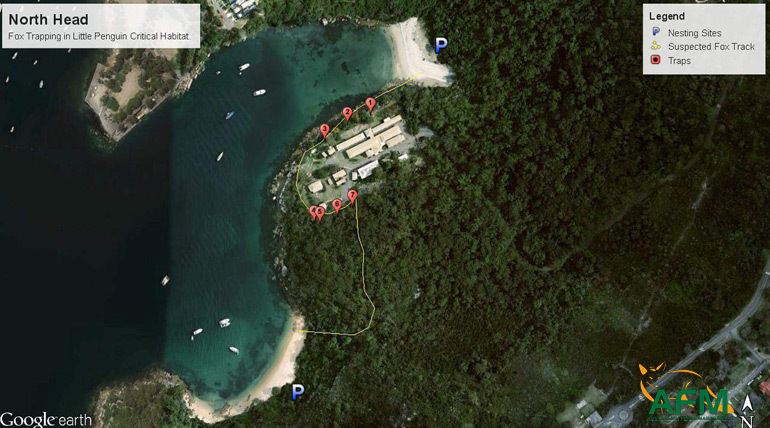 7 Traps were installed and baited on the AIPM Perimeter near areas where deceased penguins have been found. Traps were be checked each morning by NPWS staff. When setting up the the traps it was noted that there is a large population of rabbits, bandicoots and rats in this area. The trap types used at the North Head site were soft leg hold traps approved by the RSPCA, the traps are checked a minimum of twice a day. Unfortunately no foxes were caught. Heavy rains and rodent activity have made trapping this area challenging due to bait being stolen and the scented attractants reduced in effectiveness by heavy rain. If Little Penguin predation continues, a trapping program implemented carefully in the beach and foreshore areas could be effective. Eventually the fox was shot by NPWS employees, 10 day after the Australian Feral Management program was completed. 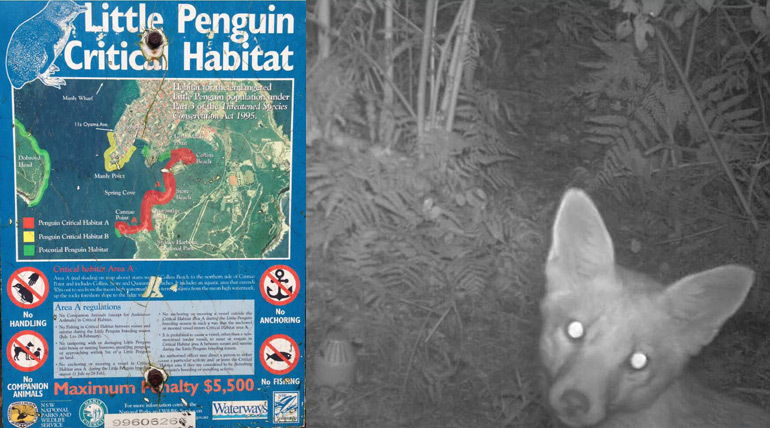 Since the fox was shot, there have been no more fox attacks on penguins in the area. Australian Feral Management Director Steve Cope commented “It’s a shame we didn’t trap the problem fox I feel this is due to the heavy rain short programme time and the fox being trap shy due to all the methods being tested prior by others”. Australian Feral Management have over 18 years of experience in fox control. Over this time we have developed our own proven control programs for clients like State and Local Governments, Australian Navy, Australian Air Force, Australian Army, National Parks & Wildlife Service and both the corporate and domestic sectors. Australian Feral Management are the only full time feral animal control firm in Sydney.